How To Get Rid Of Dell KACE Agent? 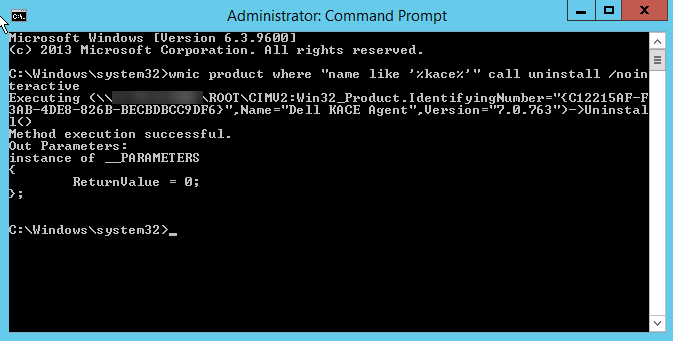 What is Dell KACE Agent? Unifies and automates non-computer and computer asset management processes from deployment to retirement, to facilitate such tasks as software and regulatory compliance. Uninstalling KACE can be a pain. Luckily there is a way thanks to wmic. ampagent.exe runs as a service named ‘Dell KACE Agent’ (AMPAgent) “Manages connections between agent and server.”. kswmetersvc.exe runs as a service named ‘Dell KACE Software Meter’ (Dell KACE Software Meter) “Manages the Dell KACE Software Meter application”. kinventory.exe is added as a firewall exception for ‘%ProgramFiles(x86)%\Dell\KACE\KInventory.exC:192.168.10.49:enableC:KACE Inventory’. ampagent.exe is added as a firewall exception for ‘%ProgramFiles(x86)%\Dell\KACE\AMPAgent.exC:192.168.10.49:enableC:KACE Agent’.